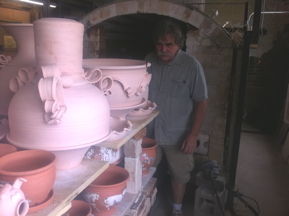 We started the day by dropping by Ayers’ Pottery on 3rd Street in Hannibal to meet Steve Ayers, son of Aunt Donna McMichael Ayers. 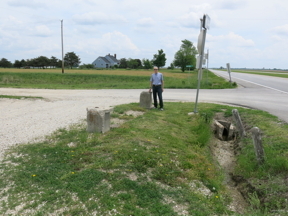 He graciously volunteered to meet us the next day, pick up his mother, “Aunt” Donna, and drive up to the old Stasey place in northwestern Shelby County. Steve gave us some family history, including a story about Doctor Archibald Borron, who emigrated from Scotland. Evidently the Borrons had lived in Scotland, were very well to do, and had sent young Archibald Borron to medical school at Oxford. Two things occurred to deplete the family fortune. First, the Borrons were in the sheep business, which supplied wool to the English textile industry. The innovation of cheap cotton from India undermined that. The Borrons were also in the coal mining business and when the Government passed rules to clean up the mines, conditions were apparently deplorable, the Borrons were bankrupted. Dr. Borron solved his cash problem by marrying the spinster, Adriana Dwindt, for her dowery. He set off for America and arrived in Missouri about 1844. 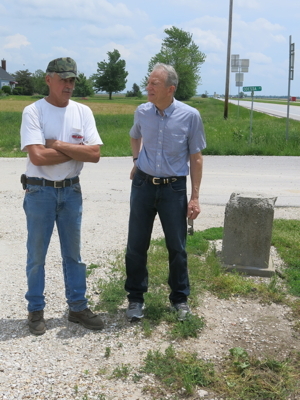 After this story, we set off to Anabel intending to see the site of the old Stasey filling station at the corner of Highway 36 and the cross road to Anabel (Intersection of Odessa and HW 36). 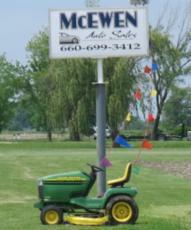 At the location of the old station we met a Mr. McEwen who runs an automotive repair place. He was about to get on his tractor to pull his riding mower out of the mud in a roadside ditch. Mr. McEwenn explained that the station had been moved away several years before and that the current buildings had been built in the ‘60s and ‘70s or later. The current owner of the property is in the automotive business. All that remains of the station at its Anabel location is a couple of concrete stumps, some pipes, and the tanks which are still in the ground. Mr. McEwen was certain the old station had been moved to Ten Mile, Missouri and gave us directions to the location, “Go up the highway toward Macon about four miles, turn right to the Ten Mile store, right down the road there for about another two miles." The station was off to the right, perhaps not visible from the road. It was presumably being used as an out building of some kind.